What changed? One thing and one thing only: price. At the end of the day, always remember that price dictates emotions, emotions dictate narrative, and narrative results in poor decision making. Now I know that nearly everyone sees the unleashing of dovishness from Fed Chair “Papa” Powell as the reason for equities closing out the month of January so strong. But none of this should be a surprise whatsoever given just how severely flat the yield curve has gotten as the Fed has hiked short-term rates. Nor should it be a surprise whatsoever when inflation expectations have been in a solid downtrend since the middle of last year, largely due to Oil prices faltering. Given the swiftly changing picture in global markets, this is a key chart to keep on your radar. In fact, I like this chart so much that it actually featured in my top 10 charts to watch for 2018 back at the start of January. What it shows is the proportion of the 70 countries we monitor whose stock market has seen a death cross (50-day moving average trading below the 200-day moving average). As of the latest data 64% of countries (45 out of 70) are in death-cross mode. Within cohorts, Developed Markets have 48% of countries in death cross mode, while Frontier Markets are sitting at 73% and Emerging Markets at 71%. So it’s clearly being driven by emerging markets, and this makes sense – I’ve written a lot about the headwinds facing emerging market currencies and EM risk assets more broadly due to the impact of a stronger US dollar and Fed tightening (rate hikes and QT). And this is where indicators like the one in this chart prove their value by flagging the emergence of real fundamental issues in drawing on information in the price. So the key takeaway from this chart is that below the surface there is trouble stirring in global equities. 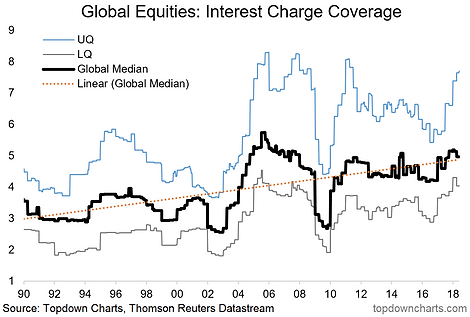 -As a result of low borrowing costs and improved profitability, global interest coverage ratios are looking healthy. -Globally, profit margins have improved since the earnings recession (EM + Commodities) of 2015/16. -It all looks pretty good, although the chart shows that investors were usually rewarded more for buying when profit margins were cyclically low vs cyclically high. 1. Global Equities – Interest Charge Coverage: Globally there has been a noticeable uptrend in interest coverage ratios over the past 30 years. As with many fundamental indicators, there is a clear cycle around the trend as well. During the 2015-16 earnings recession there was a deterioration in interest coverage ratios, which has since unwound as the indicator has recovered to a cyclical high. Naturally factors like the level of interest rates and leverage/debt loads likewise have a significant impact. So from a cyclical stand point, you would expect the interest coverage ratio to rapidly deteriorate towards the end of a business/market cycle as profitability comes under pressure and policy tightening pushes up borrowing costs. We saw this in the last two cycles, and thus it’s something worth monitoring. 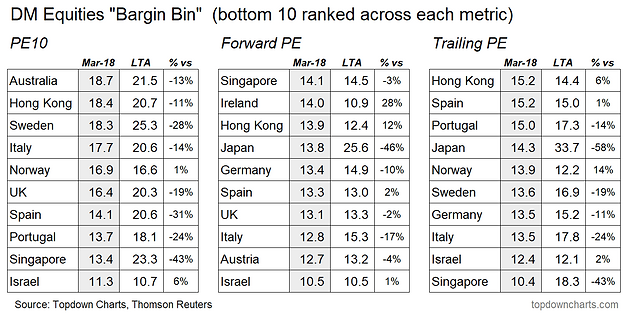 With the correction in global stock markets still running its course, it’s worth surveying some valuation statistics across Developed Market equities. Indeed, the current correction could easily go further, purely on sentiment and in the process cheapen valuations across the board. But in the mean time this article takes a snapshot of the bottom end of DM equity valuations. The table below comes from a broader discussion on Developed Market Equity Valuations in the latest Weekly Macro Themes report. The table below shows the lay of the land in the bottom 10 ranked countries within DM.